Rooster Fish, Billfish, and Tuna at Sea and Monkeys and Nightlife on Land. Experience the excitement of world class sportfishing! Manuel Antonio, often referred to as the ‘fishing capital’ of Costa Rica, is the launch point for some of the best fishing in the world. 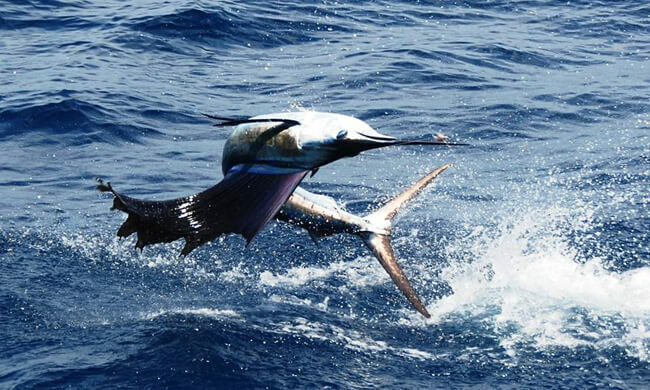 With excellent year-round in-shore fishing and amazing off-shore fishing, Costa Rica’s Pacific coast offers the best action an angler can find. Fish for marlin, sailfish, tuna, mahi-mahi, roosterfish, snook, and snapper. Full-day tour includes fresh fruit, lunch, soft-drinks, water, beer, and all tackle, bait, and equipment. To bring: sunscreen, sunglasses, hat, light clothing, light jacket. Please note that fishing licenses are not included and are to be paid at the pier. Full Day: 8 hours, 3/4 Day: 6 hours, Half Day: 4 hours. Price noted is for half day. Full day $695.